With the weather being unseasonably warm here in Seattle this year, we’ve been drinking more warm weather drinks – coolers, Collins, and sangrias – than usual for May. We especially love sangria for picnics or barbecues, but with such a great selection of ciders here in the Pacific Northwest, we thought maybe we could expand on that theme a little and try a cider sangria (or ci-gria as Christa likes to call them ;)). Read on to see how our “ci-grias” turned out. We’ve written about cider before, both standard issue and more speciality ciders liked hopped ones. 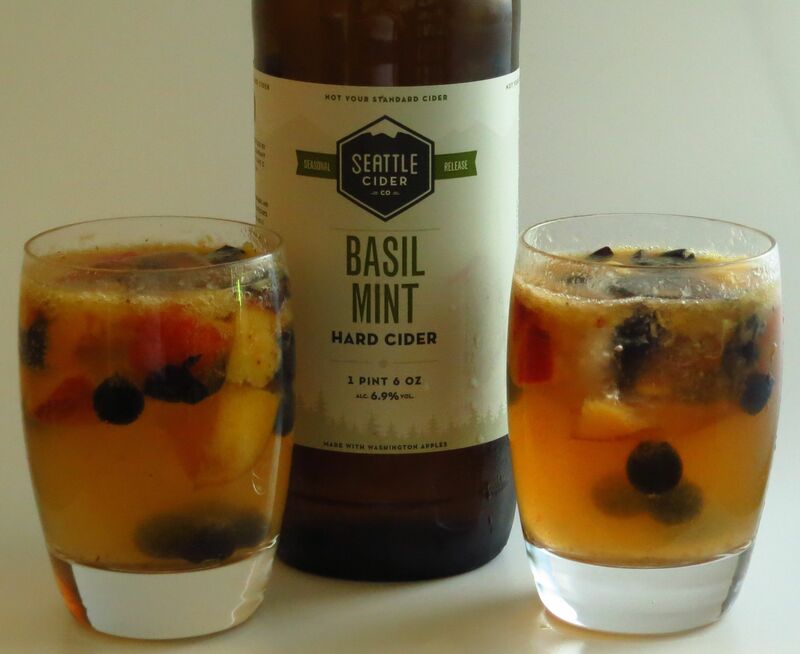 We recently came across a seasonal basil mint cider from Seattle Cider Co, and after tasting it, Christa had the brilliant idea of seeing if we could use it as a substitute for white wine in a sangria. Always up for a challenge, we decided to see what we could come up with. We started with fresh fruit, as is traditional. We had some blueberries in the fridge, and some nectarines too (did we mention it’s been warm this spring? Stone fruit season has come hella early, not that we’re complaining). We sliced some up and marinated them in the base spirit for the morning, then assembled the drink. We didn’t add the cider until we were ready to serve since we wanted to preserve the gentle carbonation for a hint of effervescence. Sliced fruit. For this particular version we used nectarines and blueberries as we felt those would pair well with the mint and basil. 1/2 a small nectarine and ~10 blueberries per drink. 4 oz cider (We used the Basil Mint cider from Seattle Cider Co). If you use plain cider, gently muddle a few leaves each of basil and mint with the fruit before adding the simple and cider. Soak fruit in spirit for an hour or more. Add simple. Top with cider. Gently stir. Add ice. Enjoy! Nose: Gin botanicals (rose & juniper), apple, nectarine, basil. Palate: Rose, nectarine, and mint with a hint of blueberry. Juniper and basil on the mid-palate. Finish is dry and mineral-y with some notes of stone fruit pit. Nose: Baked apple, little bit of nectarine, cedar wood notes, cognac. Palate: Baked apple, nectarine, frangipane (the pastry cream, not the flower). Mint and sweet blueberry on the mid-palate. Little hit of sweetness at the end of the mid-palate with a hit of sour apple right after that. Fruity finish with more nectarine. To our palates, the cognac version is the nicer of the two. It’s a little richer and comes off a little sweeter and fruitier. However, the gin version is very light and refreshing if you’re looking for a nice sipper on a hotter day. We would say the ci-gria’s are a success. Refreshing with lots of great flavor, but light and tart enough to pair well with food. 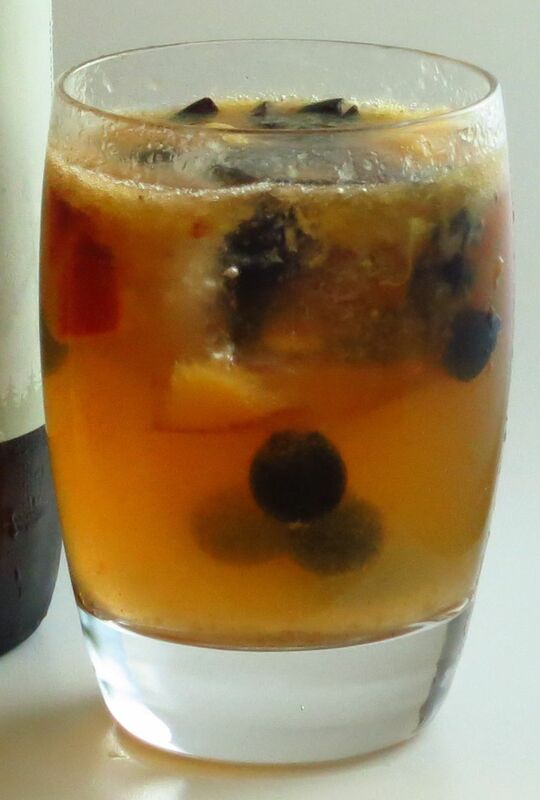 Next time you’re looking to mix things up for a party or group, why not try a cider sangria. You won’t be disappointed. Cheers! This entry was posted in cider, cognac, gin, simple syrup and tagged paul giraud vsop, seattle cider co, spy hop gin. Bookmark the permalink.